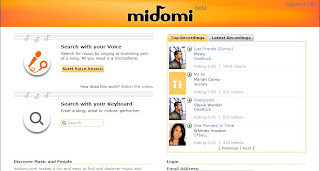 Midoim is an ultimate music search tool because it is powered by your voice. You are not only use regular text to search your favorite music, and you can use your singing, hum, or whistle to instantly find your favorite music and connect with a community that shares your musical interests. Midoim makes a lot of fun, you can easy to find a community and share your musical interests with other one. You can also listen to voices, see pictures from other people, rate singers, send messages, buy music, and more you can do.